The Giants gave Jeff Samardzija a lead in the top of the first Monday night, but it didn't last long. The second-year Giant allowed two runs in the first, four runs in the second and one more in the fourth as the Texas Rangers beat San Francisco 7-1 under the lights in Surprise, Arizona. 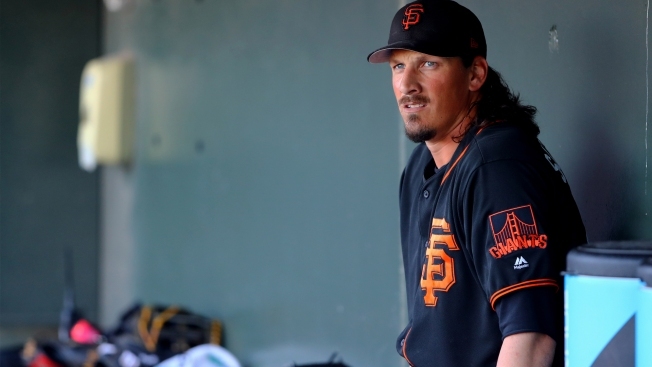 In 3.2 innings, Samardzija was tagged for eight hits, seven runs and five earned runs. He walked two and struck out four. His ERA for the spring sits at 9.82. The Giants lone run came on an RBI-single by Hunter Pence that plated Denard Span. The Giants' offense tallied seven hits off Rangers pitchers, led by Mac Williamson's two. Span, Pence, Nick Hundley, Gordon Beckham and Ryder Jones collected one hit apiece. After the game, the Giants optioned RHP Kyle Crick, RHP Ian Gardeck, IF Miguel Gomez, RHP Chase Johnson, RHP Reyes Moronta and RHP Dan Slania and reassigned OF Wynton Bernard, OF Steven Duggar, C Aramis Garcia, IF Ryder Jones, OF Austin Slater and C Matt Winn.